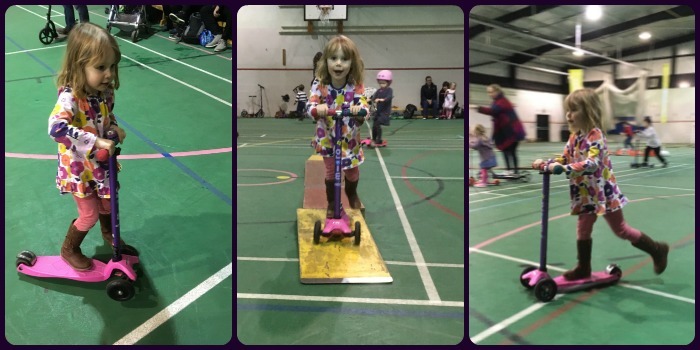 Little Miss A really enjoyed herserlf on her scooter at the Scoot Fit Disco in Sale, Manchester. The Scooter Disco is held in a school sports hall. There are lots of ramps set out and the kids can choose to go over these or just by-pass them. Little Miss A got more and more confident as the session went on with the seesaw type ramps. It's such a simple set-up really but all the kids were on the go for the whole session - whizzing round and round and round!! Of course there were a few tumbles but all the kids were briefed at the start of the session to get back up and scoot, and this is definitely what Little Miss A did. It's such a great idea to have scooters available for the parents to have a go too. Little Miss A was so chuffed when I managed to get hold of one and went round with her. I had a job keeping up with her! She's fast and definitely better at steering than me. It's so hard to find things to do at the weekends with the LOs on my own whilst Mr MoaB is working. Other than soft play centres, there's very little. This is a fantastic alternative with the added bonus that it's indoors! Perfect during the winter. It has been ages since Little Miss A has been out on her scooter so she was so thrilled with this activity. It definitely wore her out as she dozed off when we got home and she rarely naps anymore. This was my first venture into Manchester from our new house and it took us about 35 minutes to get there. Hopefully, I'll get the chance to take Little Miss A again. The Scoot Fit Disco costs just £5 per child. There's no charge for adults even though they can join in! It's thirsty work all that scooting, so best take refreshments for the kids. The sessions run at a few venues around Manchester until the beginning of April. I found all the details on the Scoot Fit Disco Facebook page. I absolutely LOVE this idea! My 4 year old is desperate to scoot but finds it tricky, and we just don't seem to have the time to help him gain his confidence, so a session like this would suit us really well. I'm off to have a look to see if there's anything like it near us! Thanks so much for joining #daysoutwithatoddler :) see you next month! It's good fun. Great that parents can join in too! How fun that Daddy now has his own scooter! Lots of fun ahead as the weather gets nicer and can get out on their scooters. This disco is great for the winter as it's indoors but will be good for LO to get back outdoors with her scooter soon! You'd have to be super fit to push a buggy round at the same pace that the kids wizz round on their scooters!